To Bling or Not? - How much can your Horse Sparkle in Competition? We all like a bit of bling, don’t we? I mean, who can’t resist a little bit of sparkle and shine to make you and your horse stand out? I’m a sucker for a bit of diamante! Where ever I can, I’ll throw a bit of sparkle on my horse’s tack. Be it browbands, ear bonnets, my riding hat, I’ll find a way to add a bit of bling. However, when competing under FEI rules, you may not be allowed as much bling as you might like. The current British Dressage (BD) and the Fédération Equestre Internationale (FEI) rules state that diamante browbands are permitted. However, ear bonnets with metallic thread and brow bands containing anything but leather or diamantes are not permitted. A statement from a British Eventing staff member said “diamante browbands are allowed, as long as it does not alter the normal configuration of the bridle”. Non-affiliated events that run under their own rules may have no problem with how much or how little you want your horse to be blingy. When investigating ruling from United States Dressage Federation (USDF) there didn’t seem to be any comment in the USDF handbook about the use of decorative crystals on tack. However, ruling may differ between competition venues and dressage boards. If you’re unsure of any ruling, simply ring up the competitions organizers or check in their rules & regulations. Also, be aware that some judges prefer more traditional, plain tack over blingy tack, and could mark you down accordingly. The BETA (British Equestrian Trade Association) have stated that for British Dressage events that the riding hat MUST be predominantly black, navy blue or a conservative color that matches the riders jacket. This means NO BLING. Unfortunately competing at high levels means that professionalism over takes looks and blingy-ness. The USDF states that a rider may wear a jacket in colors within the HSV color scale, so long as the V value is at 32%. This gives riders a wide range of colors to choose from for their jackets. BD do allow for horses to be be plaited in diamante bands, giving horse & rider that extra bit of sparkle as compete. In disciplines such as show jumping and eventing, bling isn’t ruled out and most blingy add-ons are permitted. With the exception of it being overly dramatic or dangerous to others (let’s be honest, no one wants to be blinded by tack). The United States Eventing Federation (USEF) state that blingy brow bands and non-metal blingy nose bands are permitted in competitions but extravagant decorations such as glitter etc. are not permitted. With international competitions follow similar rules, allowing riders to compete without the risk of being eliminated for indecent tack. But always check the competitions rules & regulation about horse and rider attire beforehand. However, with a little bit of glitter and some nice arena lighting, your horse will stand out and literally glisten as it competes. I know some people enjoy having plain and simple tack. But this plain and simple tack can look just as dazzling with the right tack cleaner and elbow grease! Whether you like having diamante all over or something plainer. There are plenty of ways to make you and your horse shine even more than you already do! 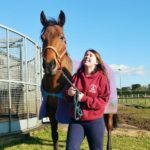 Katy is currently a student at the Royal Agricultural University, studying BSc Bloodstock and Performance Horse Management. Alongside this she’s an active young farmer’s member and is currently working for a Stud in Wiltshire. Despite not having her own horse currently, she often finds herself around horses, covered in horse hair and mud! She plans to work with horses following her degree, hopefully in the breeding industry, due to her love of foals!